First I have to say that this book was confusing to me at the start. I don’t know what I was expecting but this stream-of-consciouness, confessional, journal-entry, mind trip wasn’t it. But the more I read, the more I began to enjoy myself. The stories seem random, the musings of an older mind remembering the past with some kind of nostalgia, but when, suddenly, I am shown the connection between the story and the process of writing, I am speechless. 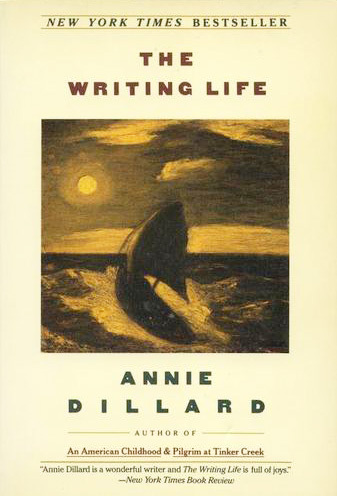 Breathtakingly honest and incredibly real, Annie Dillard has woven a “tale” about how life and writing intertwine around and unravel one another. It’s hard to tell you exactly what this book is about because it is about a life process. And as we writerly types know, a life process is difficult to pin down. I think the best way to entice you to read this remarkable book is to introduce you to some of my favorite moments from the book. Enjoy! The path is not the work. The part you must jettison is not only the best-written part; it is also, oddly, that part which was to have been the very point. If he has read his pages too often, those pages will have a necessary quality, the ring of the inevitable, like poetry known by heart; they will perfectly answer their own familiar rhythms. Is it pertinent, it is courteous, for us to learn what it cost the writer personally? This writing that you do, that so thrills you, that so rocks and exhilarates you, as if you were dancing next to the band, is barely audible to anyone else. The line of words fingers your own heart. It invades arteries, and enters the heart on a flood of breath; it presses the moving rims of thick valves; it palpitates the dark muscle like a worm encysted – some field of feeling, some song forgotten, a scene in a dark bedroom, a corner of the woodlot, a terrible dining room, that exalting sidewalk; these fragments are heavy with meaning. The line of words peels them back, dissects them out. Will the bared tissue burn? Do you want to expose these scenes to the light? You may locate them and leave them, or poke the spot hard till the sore bleeds on your finger, and write with that blood. If the sore spot is not fatal, if it does not grow and block something, you can use its power for many years, until the heart reabsorbs it. A work in progress quickly becomes feral. You must visit it every day and reassert your mastery over it. If you skip a day, you are, quite rightly, afraid to open the door to its room. The work is not the vision itself, certainly. It is a golem. You try – you try every time – to reproduce the vision, to let your light so shine before men. But you can only come along with your bushel and hide it. Chapter Four. You just have to read it. I can’t even begin to explain it. There is something you find interesting, for a reason hard to explain. It is hard to explain because you have never read it on any page; there you begin. You were made and set here to give voice to this, your own astonishment. The writer studies literature, not the world. He lives in the world; he cannot miss it. The body of literature, with its limits and edges, exists outside some people and inside others. I really can’t recommend this book highly enough, especially if you love to write. Take your time with it, enter into the experience of writing through the eyes of a master!